YCHS celebrated second-quarter student achievements during Friday morning’s Honors Assembly. YCHS Board member Father John Hagileiram, S.J., spoke to the students and then handed out their awards. Father John began from a historical perspective, mentioning the first school in Yap and the founding of Xavier High School 65 years ago in Chuuk. He went on to say that graduates of those schools have become leaders across the FSM. He encouraged the YCHS students to be among the first graduates to come back to Yap and serve as leaders, especially in roles such as priests, sisters, and teachers. Father John thanked the YCHS faculty for the many sacrifices they make. He encouraged the students to trust their teachers and work together with them. Fr. John used the example of crabs in a bucket. “If there’s more than one crab,” he said, “they will never achieve their goal of getting out of the bucket. They work against each other. Once one crab starts to climb out, another pulls on it and brings it back down into the bucket.” He warned the students about working against each other and said that by working together, they will eventually achieve their goals. Fifty-two students, 73 % of the student body, earned Perfect Attendance Awards by being at school and on time every day during the second quarter. (As of the end of the second quarter, the school-wide attendance rate stood at 99.9%.) Thirty-nine students earned Second Honors by achieving a grade of 80% or higher in all classes. Nineteen students from all four years received First Honors – average of 90% or higher in all classes. Achieving First Honors were: Johanne Arao, Roselyn Beltran, Jennaia Chonmon, Ashley Lewaletang, Marcia Matnan, Julia Ranganbay, Tristan Ruway, Jaimaleen Waayan, Hans Banua, Renee Choorang, Bryan Bomtam, Jalani Gootinmutnguy, Shawn Libyan, Natasha Loochaz, Blossom Moofal, Rozeanne Ruema, ‘Cisco Yarofalyango, Jancely Harongreg, and Kobe Sacres. 18 of the 19 First Honors students also earned Perfect Attendance. Congratulations! PICTURED BELOW ARE FIRST HONORS WINNERS WITH FATHER JOHN. Joining the YCHS faculty this semester will be Mr. Tom Elitz, a Jesuit novice from Cinnaminson, NJ. Mr. Elitz is a graduate of St. Joseph's University in Philadelphia, PA. While attending St. Joseph's, Mr. Elitz studied accounting. He also helped organize student retreats, participated in service immersion trips, and played on the club baseball team. After graduating from St. Joseph's in 2012, he worked as an accountant for Johnson & Johnson. He joined the Jesuits in 2014 and has spent the past year and a half in the novitiate in Syracuse, NY. Mr. Elitz will be teaching Math and ELA this semester. PICTURED BELOW ARE FR. MULREANY, MR. ELITZ, AND FR. CORCORAN. Dr. Reed Perkins, a Professor of Environmental Science at Queens University of Charlotte, has been visiting Yap for nearly 20 years facilitating environmental research of all kinds. He graciously visited Yap Catholic High School recently to speak with our freshman Earth Science students about the importance of preserving our environment. Dr. Perkins explained that with increasing global temperatures, the ocean is undergoing a process called thermal expansion—the expansion of water as a result of warming temperatures. This thermal expansion, he explained, alongside the melting of glaciers at the poles are contributing to a rise in sea levels. Dr. Perkins went on to discuss research he has been conducting alongside the US Forest Service and the Yap Division of Agriculture and Forestry to understand the implications of rising sea levels for taro patch production on Yap. He alerted our students that increasing sea levels has resulted in saltwater intrusion on prime land used for taro production. His research suggests that the people of Yap will have to explore the possibility of finding new land for taro production further inland or elsewhere. Dr. Perkins ended class with a lingering message that young students are the ones who must find ways in the future to mitigate environmental problems that are detrimental not only to the people of Yap, but also to the people of the world. Pictured below are Dr. Perkins, Ms. Gopal (Earth Science teacher), and the freshman class. 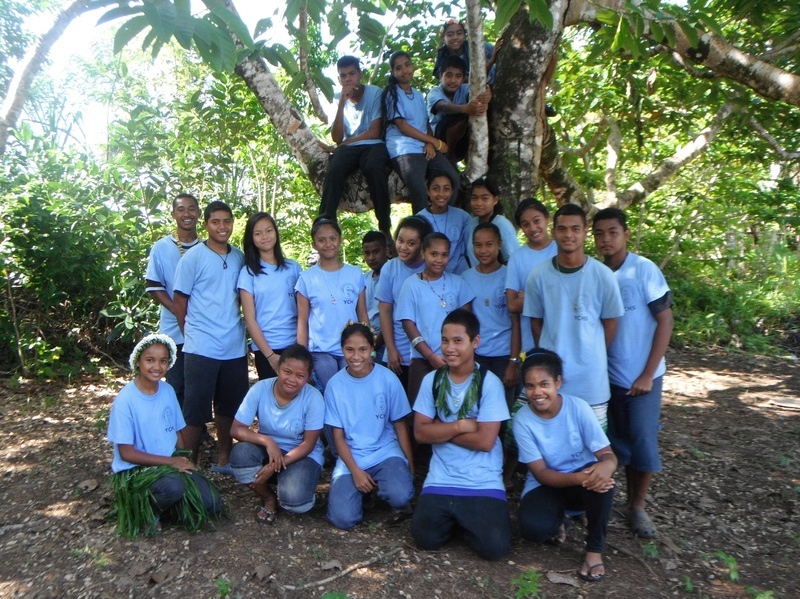 Yap Catholic High School recently celebrated its First Quater Awards Ceremony during the school's Morning Assembly. School principal Father Corcoran, S.J. congratulated the student body for achieving a record number of both academic and attendance awards. Thirty-six students (49% of the entire school) earned Second Honors by achieving a grade of 80% or higher in all six academic classes. A school-record twenty-six students (35% of the student body) earned First Honors for the quarter by earning 90% or higher in all their classes. Sixty-three students (85% of school) also achieved Perfect Attendance by being at school and on-time every day. Winners of First Honors were: Johanne Arao, Roselyn Beltran, Jennaia Chonmon, CeeCee Keppin, Marciarose Matnan, Julia Ranganbay, Tristan Ruway, Nicholas Untun, Hans Banua, Samantha Gilinug, Jollynn Gilyoochen, Giselle Giyetinag, Quinnie Paag, Zoya-Marie Sigeyog, Elizabeth Biyou, Bryan Bomtam, Alora Finey, Jalani Gootinmutnguy, Maia Lesarof, Natasha Loochaz, Blossom Moofal, Rozeanna Ruema, 'Cisco Yarofalyango, Marcy Kentun, Demetria Mtag, and Kobe Sacres. Pictured below are the First Honors winners with Father Corcoran. Congratulations! Two YCHS students, senior Jersaleen (“Jersy”) Waayan and sophomore Quinntiara (“Quinnie”) Paag, recently earned first place honors in a state-wide essay contest. Quinnie won the top award for the freshman/sophomore level, and Jersy’s essay was the best in the junior/senior division. Fellow senior Demetria (“Demi”) Mtag's entry finished third. Quinnie’s essay focused on the importance of clean water for our island, pointing out that various forms of pollution often have negative effects on water supply. She also wrote about the use of ditches and dams to control water flow and the importance of clean water tanks and effective water filtration systems. Jersy’s essay focused in on the problem of land erosion. She wrote about various ways Yapese people use both rocks and trees to control erosion – in gardening, along river banks, and in our coastal areas. Jersy encouraged local people to continue working hard to care for the natural resources of our island. Congratulations Jersy, Quinnie, and Demi! All three are pictured below. YCHS has officially welcomed the newest members of the school community -- the class of 2019. As the final step in the extensive Admissions Process that began in the early spring, twenty-two freshman candidates were invited to the Summer Session during the month of July. At the end of the Summer Session, Father Corcoran (YCHS Principal) announced during Morning Assembly that all twenty-two candidates had been accepted into the new freshman class. Upperclassmen and faculty congratulated and welcomed the new class with thunderous applause. The YCHS class of 2019 is made up of Johanne Arao, Roselyn Beltran, Jennaia Chonmon, Ignatius Defngin, Angelika Faimau, Kaylord Finey, Sasha Gapthey, Stephanie-Zoya Gurtmag, CeeCee Keppin, Ashley Lewaletang, Glimmer Marpa, Marciarose Matnan, Cyril Moofel, Julia Ranganbay, Ashley Rapgeg, Tristan Ruway, Clancy Sewemor, Jayvie Taruweliut, Anita Tman, Nicholas Untun, Jaimaleen Waayan, and Joshua Yilon. Congratulations! Pictured below is the new freshman class. YCHS recently announced the winners of its four full-tuition scholarships for the 2015-2016 school year. All four scholarships, funded by an anonymous donor, are named for Jesuits associated with the founding of YCHS. Freshman Johanne Arao is the new Father Michael Corcoran Scholar. Father Corcoran was the first Principal and Director of YCHS when it opened in 2011. 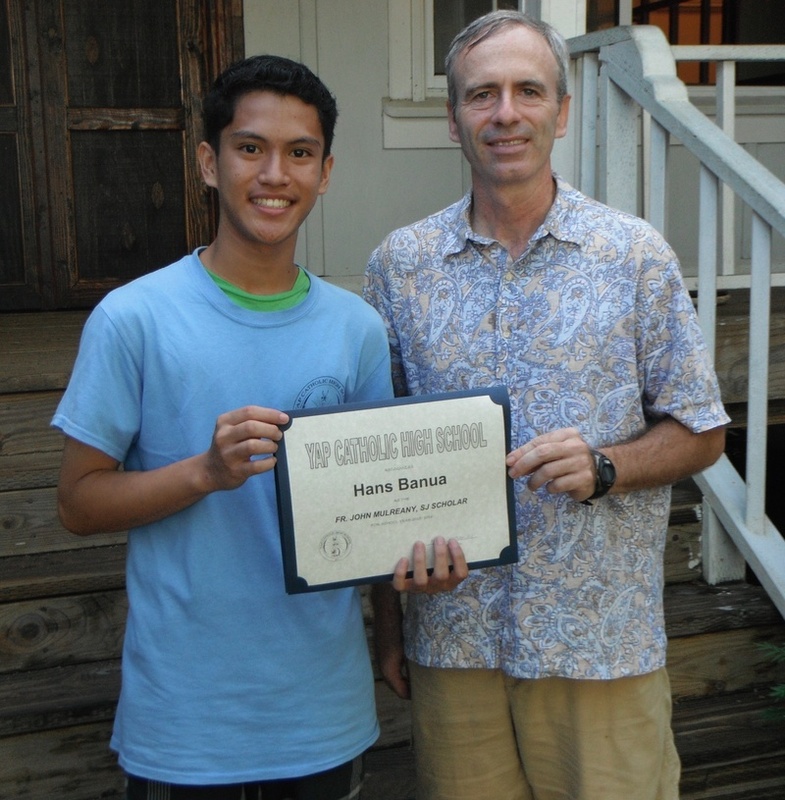 Sophomore Hans Banua was named the Father John Mulreany Scholar. Father Mulreany was one of the original founders of YCHS and now serves as College Counselor, Assistant Director, and member of the teaching faculty. 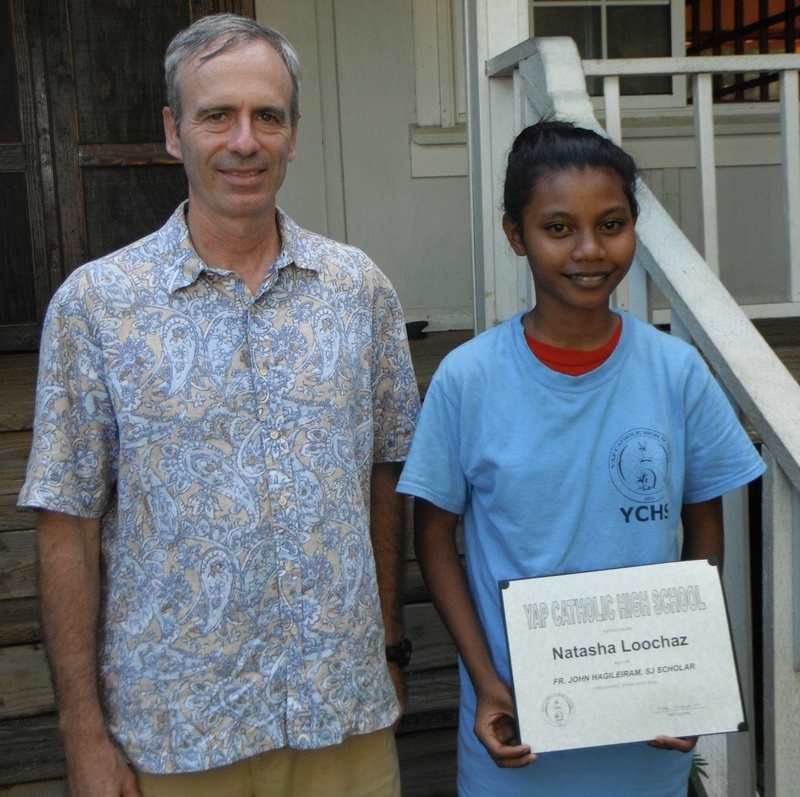 Natasha Loochaz is the new Father John Hagileiram Scholar. 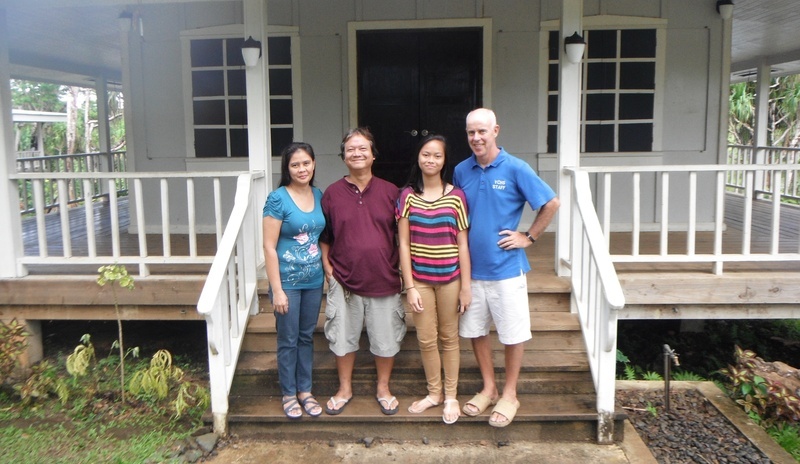 Father John H was the Jesuit Regional Superior of Micronesia when the original planning process for the school took place. Senior Kobe Sacres was named the Father David Ciancimino Scholar. Father Ciancimino was the Provincial of the New York Province who missioned the first Jesuits to YCHS and was the commencement speaker at its first graduation. Four YCHS students have also earned Habele Scholarships for the 2015-2016 school year. 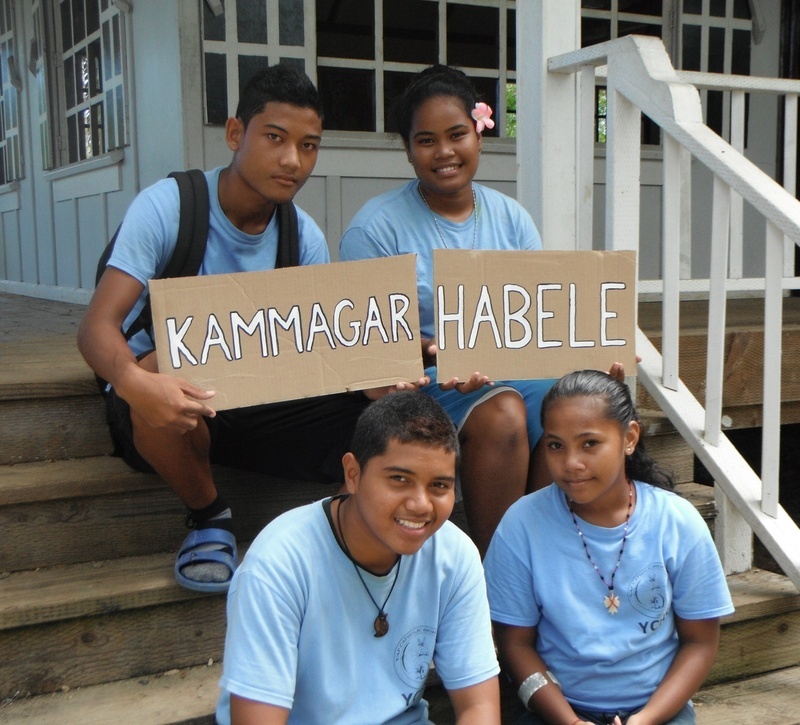 Freshmen Glimmer Marpa and Jennaia Chonmon, junior Francis ('Cisco) Yarofalyango, and senior Decyann Pete were all chosen by the Habele Outer Island Educational Fund to receive 75% scholarships. Pictured below are Fr. Mulreany with Hans, Natasha, and Kobe; Fr. Corcoran with Johanne and her parents; and the four Habele Scholars (Glimmer, Jennaia, 'Cisco, and Decyann). Congratulations! "What makes me happy to be a religious today?" Coconut palms and hibiscus flowers welcome students as they walk down our driveway to the administration building. Before reaching one of their classroom verandas, they pass by two offices: one for the principal and another with college pennants in the window. At a school with no PA system and no hall passes -- or halls -- I have to find creative ways to catch up with students as their college counselor. When the students walk by, I slide open my office window with a big hello, and ask if they could come inside to pick up an acceptance letter or check their email. Soon thereafter, the seniors would just hand in forms through the window -- a drive-thru college counseling practice! What makes me happy as a regent at Yap Catholic High School are the variety of ways that I get to know and to serve our 65 students. At one point this year I was teaching every one of them in addition to coaching them in drama and basketball and helping them with the college process. On Friday afternoons, I usually need to hand back essay edits, so I simply stick my head out the window and wait while every student passes on the way to the bus. They say, "Goodbye" or "Make good decisions this weekend, Mr. Nolan," with a laugh, since that is our hope for them. 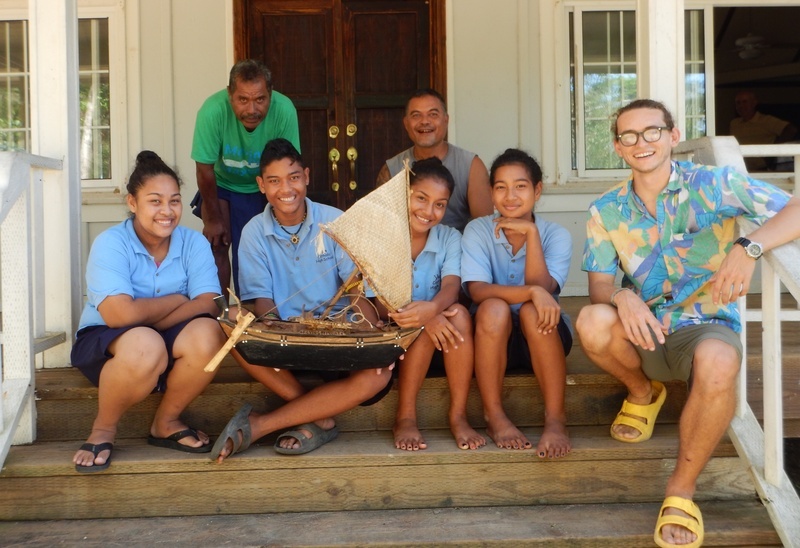 I'm reminded that because of my "good decision" to enter the Jesuits and the abundant grace I've received from the Lord since making it, I am able to teach these wonderful students on this beautiful Pacific island. Thank you Mr. Nolan and Fr. Mulreany for the many ways you have served the people of Yap! A resolution expressing the appreciation and congratulations of the people of the State of Yap to Fr. Michael Corcoran, S.J., Fr. John Mulreany, S.J., and Mr. Patrick Nolan, S.J. for their efforts and assistance with Yap Catholic High School (YCHS). BE IT FURTHER RESOLVED that certified copies of this Resolution be transmitted to Fr. John Mulreany, S.J., Fr. 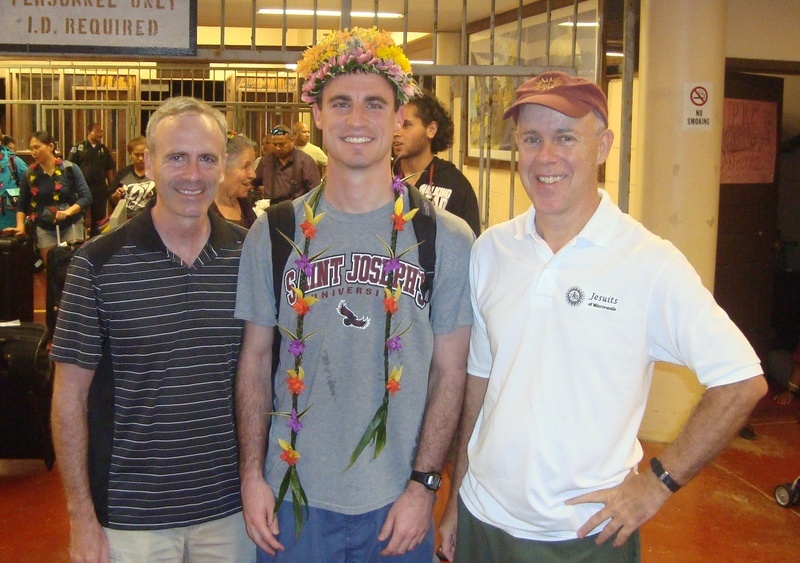 Michael Corcoran, S.J., Mr. Patrick Nolan, S.J., the Governor of the State of Yap, the Chairman of the Council of Pilung, and the Chairman of the Council of Tamol. Many thanks to Senators Nicholas Figirlaarwon, John Mooteb, and Ted Rutun for proposing the resolution. Direction for the canoe was provided by two local men (Larry Raigetal and Carlos Yarofaireg ) who are members of Waa’gey, a local NPO dedicated to emphasizing the importance of traditional Yapese arts and culture. The Flying Proa now proudly hangs in the school’s administration building as a testament to the students’ hard work and Yapese culture. Pictured below are Mr. Lupo, Larry, Carlos, and the student members of the Carving Club.